While some of the Hackaday crew is in LA for The Gathering, we decided to make a trip out to Apex Electronics, easily the oldest and largest electronics surplus store on the west coast. Inside Apex, everything is stacked to the 20-foot ceiling with any electronic component you can imagine. Want a shopping cart full of huge capacitors? Awesome. Tube sockets? Done. Any kind of wire imaginable? That takes up two aisles. Test equipment abounds as well with oscilloscopes, signal analyzers and function generators, multimeters, and even a pair of cockpit voice recorders. There’s also an outside yard at Apex containing at least two airplanes (one is a Cessna 150 that’s crying out to be made into a flight simulator), yet more test equipment, tons of video equipment, a few aircraft drop tanks, and enough aluminum extrusion to build anything. If you’re wondering how fair the prices are at Apex, I picked up a grab bag assortment of wire wrap sockets (including a few 64-pin DIPs) that would cost $100 through the usual eBay/Chinese retailers for only $5. [Mike] picked up some stepper motors, proto boards, a pound of standoffs, and a dozen some vintage 7-segment displays for $20. No clue how much the test equipment costs, but from what we’ve seen the prices are low. We’re not the first EE/Hacker Blog/Vlog to visit Apex. [Dave Jones] made the trek a few years ago and posted an awesome video. Below you’ll find a ton of pictures from our trip. 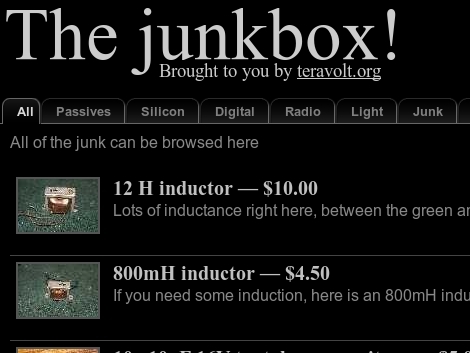 Regular reader [Grenadier] wrote in to let us know about his newly published hacking hardware trading post called The Junkbox. Apparently when he’s not blowing up capacitors or building his own high voltage ones, he makes time to code up a website where you can buy, sell, and barter leftover components. We have something like this right here at Hackaday. The dollar sign icon along the right column, just underneath the featured posts banner will take you to our classifieds section which at the time of writing had a whopping nine items posts. But these things to ebb and flow. Check in on the newly posted link from time to time to see that number grow. Whether it’s over at The Junkbox or in our classifieds section, we think the biggest problem is finding what you need when you need it. This is nothing new. If you missed it before, we’ve embedded an older episode of the EEVblog after the break where [Dave Jones] tours Apex Surplus. It’s as if a hacker who has hoarding tendencies bought a store forty years ago and just kept piling more and more merchandise to the sky. [Julian] was rummaging through a military surplus store when he spotted a pair of old helicopter pilot helmets that he absolutely had to have. At $25 they were a steal, but pretty useless in their current state. He decided to modify one of the helmets for use while playing video games, but he didn’t stop there. The helmet had two decent speakers built-in so he kept them, but tweaked the wiring from a mono-only configuration to accept stereo input. A RF wireless headset was disassembled and wired into the helmet so he could use it for playing video games while his wife is asleep. As an added bonus, the headset he used happened to have an AM/FM receiver built in, so he can enjoy music while sitting around with his helmet on as well. A Bluetooth cell phone headset was also torn down and wired into the helmet for gaming and handling phone calls. The Bluetooth mic was extended into the original mic stem built into the helmet, keeping things authentic-looking. Overall it’s a quite a useful recycling of some old military junk. It’s a great idea though the helmet looks like it could be a touch cumbersome after awhile.